It's official. 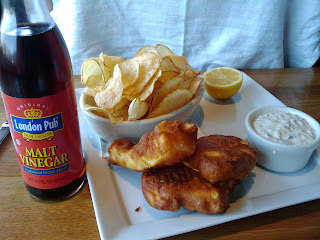 Westside Tavern is my new favorite go-to place for lunch and dinner in West LA. I've been there four times since it opened back in late March and they've hit it out of the park every time both in food and service. The Crispy Ricotta Filled Zucchini Blossoms rivals those at Pizzeria Mozza. Handmade Handkerchief Pasta with Chicken Sausage is almost too beautiful to eat but you'll want to eat that pillowy pasta in that delicious tomato ragu sauce. The Beef Short Rib Pot Roast is a must try. First, it's a very big piece (not the pathetic palm-size pieces you sometimes get at fancy pants restaurants). Second, the meat is so tender you won't need a knife. Third, the flavors are amazing; it'll make your shoulders come up to your ears. The Grilled Angus Strip Steak is the only so-so item for me. It's not bad but it's a steak. There are so many other interesting things on the menu to try. Their daily specials, charcuterie + cheese plate and crudo sampler changes often depending on what is available/in season. You can see the daily offerings on this giant chalkboard they have hanging opposite their spacious and swanky bar which serves an array of creative and delicious cocktails, craft beers and wine. The James Ranch Lamb French Dip is tender and full of savory lamb flavors; I don't know how I can just have a regular Beef French Dip anymore. I had this on my first visit and I've had to resist really hard each time to not order it again so I can try new things. 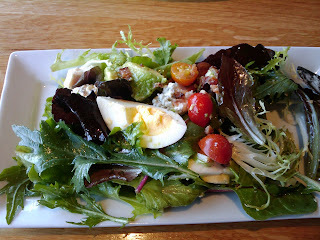 I love ordering the Spit-Roasted Cobb Salad and splitting it as an appetizer. 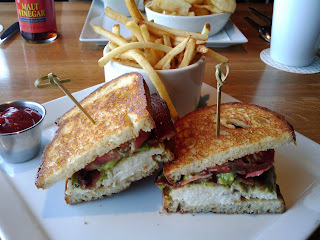 Juicy Grilled Chicken Club with thick-cut bacon, guacamole and garlic aioli on perfectly toasted sourdough bread. OMG. This Brown Butter Apple Pie with homemade butter pecan ice-cream is heaven. It totally makes me question why I keep trying to bake apple pies at home. This one is served warm and your eyes will just roll to the back of your head when you take bite of that buttery flaky crust. Westside Tavern is very generous with all their portions but they're not obscene like Cheesecake Factory. The appetizers are good to split between 2 people. You might also want to split entrees if you've ordered a lot of appetizers (and you should save room for dessert). Besides that crazy good apple pie above, there's also Sticky Toffee Pudding and peaches are in season so there's Peach Crisp. Again, desserts are big so I highly recommend sharing. So, check it out! It's also the perfect place if you're catching a movie at the Landmark.